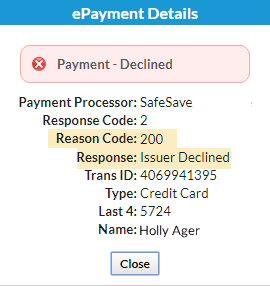 When a credit card is declined, Jackrabbit receives a decline response with a reason (decline) code. These are created by the gateway and merchant processors, not by Jackrabbit. Decline codes and responses are not standardized across payment gateways because they most often originate from the customer's bank. Some banks will provide information that explains the reason for the decline while others will only tell the gateway that the transaction declined and give no further information. "How can I find out more information about why my customer's card declined?" 200 series decline codes reflect transactions that were received by the gateway, forwarded to the merchant processor, and then declined. This is a sign that something is wrong with the cardholder’s card or their account. Your customer should contact the bank that issued their credit card (issuing bank). 300 series decline codes are rejected by the gateway, they never make it to the merchant processor. Most often this means you are attempting to process a specific service that you are not set up for, e.g. ACH/Bank Drafts. You may also get a 300 decline code if you try to process a duplicate transaction (same $ amount to the same card in a short period of time). In this case you should contact your gateway. Be sure to read the explanation in the note field. 400 series decline codes indicate a possible conflict between what information the gateway has versus what the merchant processor has. Contact your gateway provider to resolve. Every decline code will have an abbreviated explanation in the notes. Sometimes these are perfectly clear, other times not at all. Your payment partner (gateway provider) should be able to provide more detail. 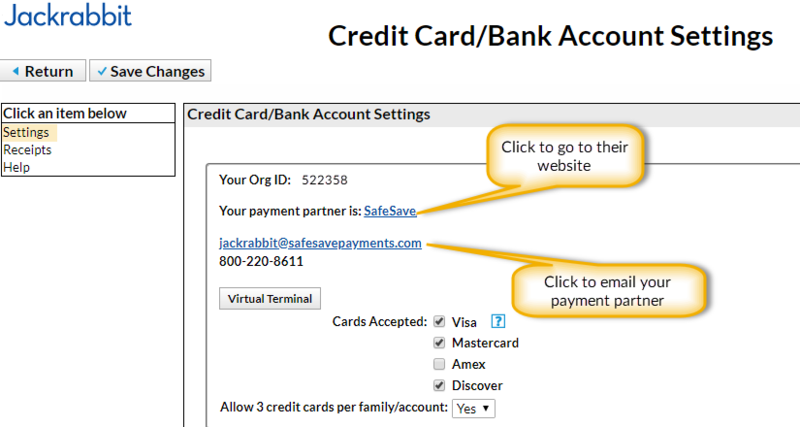 You can find your payment partner's contact information in your Jackrabbit database. From the Tools menu select Credit Card/Bank Account Settings.